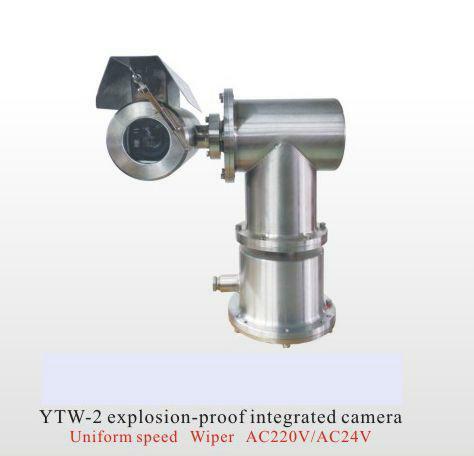 YTW-2 Explosion-proof Integrated Camera regards as a small explosion-proof video supervising system, which consists of explosion-proof camera, pan/tilt and decoder. The explosion-proof function totally meets the standard of the mechanical and electronic demand of China explosion proof GB3836-2000. It can be applicable for the dangerous circumstances of volatile gas and flammable powder, such as hydrogen（H2）and hydrocarbon gas in the plants（expect C2H2）. The exterior is so concise and simple that it is convenient for on-the-spot installation. Meanwhile it could attach the integral integration video camera or mini-zoom lens camera and infrared lamp to it.